Pedigree muscle fiber combination and VO2 max make Russell Stevenson fast, but don’t fully explain how he became a masters world champion in cyclo-cross. “I think it came down to who committed to being prepared all the way through the year and all the way into February, and I did,” he said, one week after his early February win in Louisville, Kentucky. Stevenson relied on five things to get ready for the event. Call them actions, habits, or choices; they all hold one element in common. They were just part of Stevenson doing his thing. Applying all of them with extraordinary intent sealed his success, and any aspiring champion can benefit from doing the same. That starts with wanting something, setting a goal. 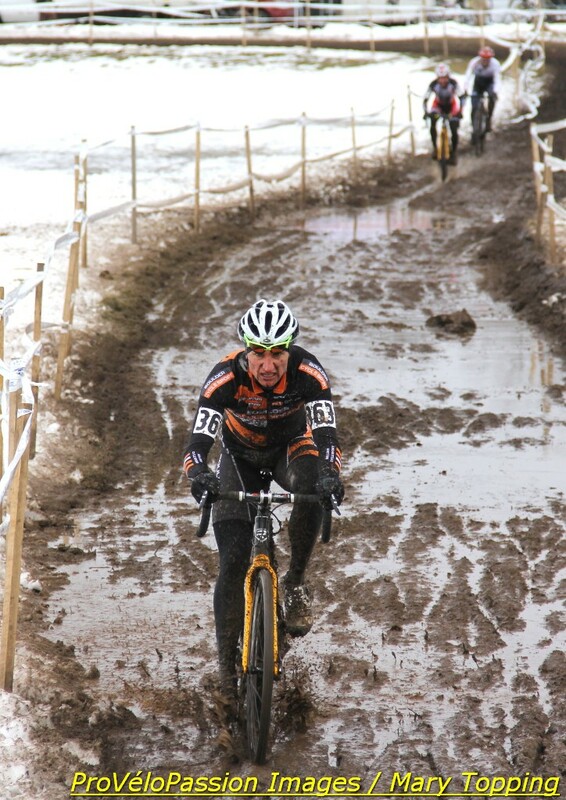 Early in the 2012/13 cycling season Stevenson targeted the national and world cyclo-cross championships. 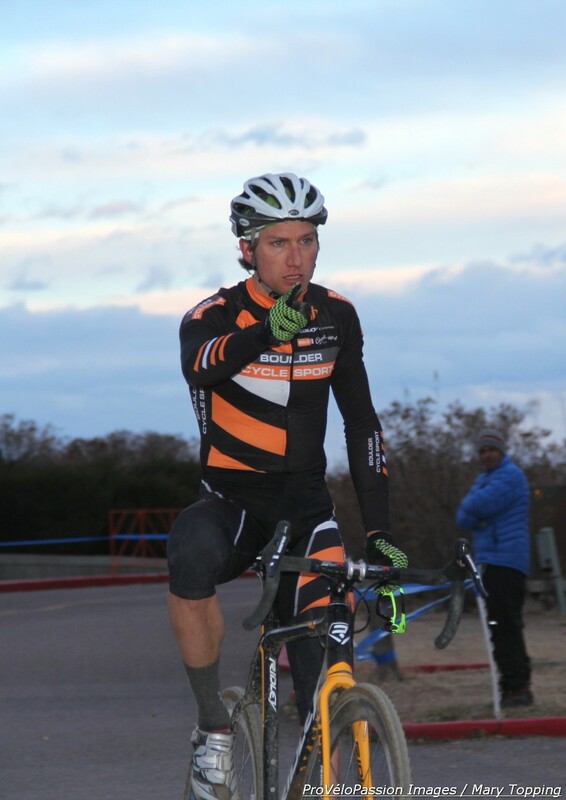 A former national champion in road and mountain biking, adding a cyclo-cross national title would give him a triple crown. Nationals fit into an early January 2013 time slot. Worlds followed about three weeks later and would occur for the first time in the history of the event on U.S. soil. That tempted Stevenson with a likely once-in-a-lifetime opportunity he couldn’t pass up. Like nationals, he planned to compete in the 35 to 39 age group. He and his Boulder Cycle Sport teammates made a plan to arrive at both events prepared. That meant committing time to train. Stevenson’s weekly training averaged about eight hours, excluding racing. It included up to two hours of cyclo-cross specific exercises such as twenty to forty minutes of intense race-simulation with his teammates. A stay-at-home dad with a nearly year-old son, Stevenson is also a husband and a sales representative for a cycling apparel company. He completed training in part by multi-tasking. 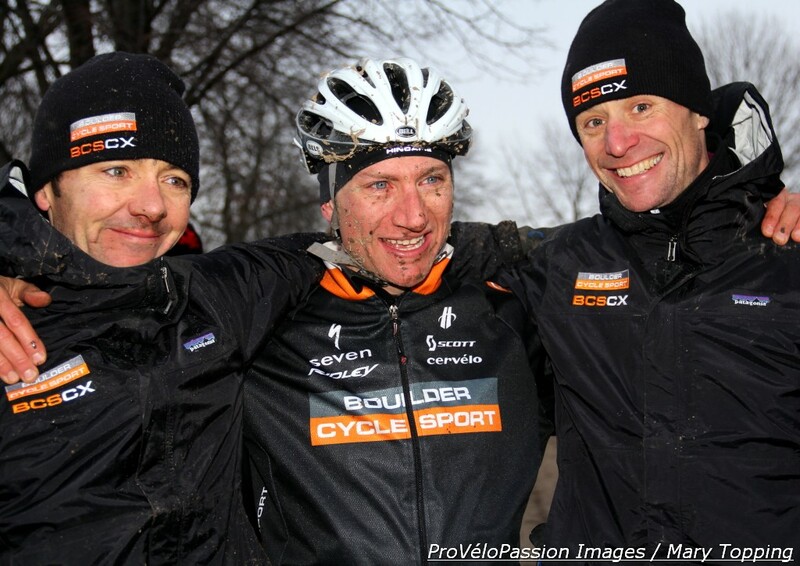 Joining the “hyper ‘cross-focused” Boulder Cycle Sport team helped him enormously, Stevenson said. The team is connected with the Boulder bike shop founded by Brandon Dwight and Taro Smith that goes by the same name. Stevenson became part of the team right before the 2012/13 ‘cross season began. “What comes with the team is a group of people to train with that are strong and kind of on the same program you are,” Stevenson said, also citing support from the team’s sponsors. Now 37 years-old, Stevenson has raced his bike since age 15. He’s won and collected flowers on the podium at major U.S. races like the Mount Hood Cycling Classic, raced on professional teams whose rosters included riders like Chris Horner, and earned over a dozen combined Washington State road, criterium, hill climb, MTB and cyclo-cross titles. The Stevensons moved to Boulder from Seattle in October 2011. Even as an accomplished racer, Stevenson feels he’s benefited from the experience of his Boulder Cycle Sport teammates which include veterans Pete Webber and Brandon Dwight. The two have world and national championship titles between them. Webber and Dwight crewed for Stevenson during cyclo-cross nationals; their expertise helped Stevenson roll to a win under conditions where mud caked inches thick onto bikes, rendering them useless unless a crew cleaned them thoroughly twice a lap. It seems support from his family meant even more. His son Nils played a big part. Prior to Nils’ birth in April last year, Stevenson’s concerns about how a baby could consume his life prompted him into action. 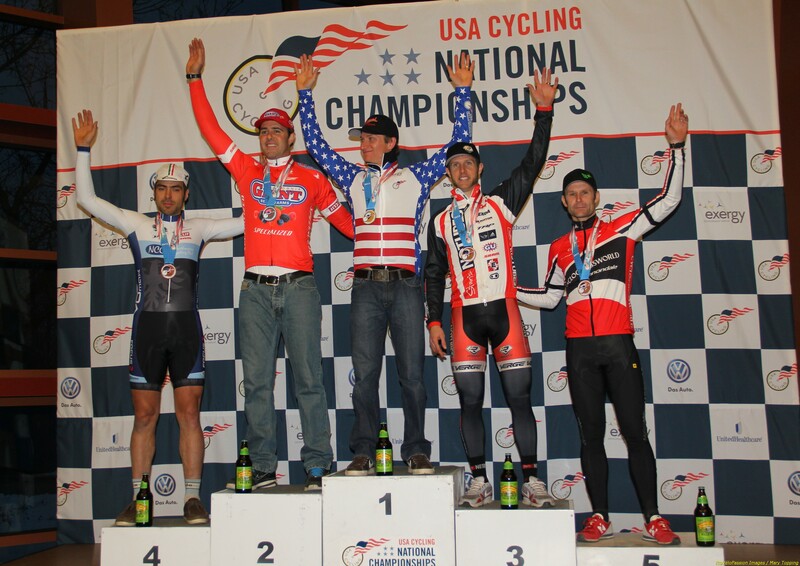 He lost weight, notched up his fitness to a high level, and won some local races. “As if I was going to lose it all, I was super fit in preparation for… nothing,” Stevenson wrote in a race report online. Becoming a father progressed more smoothly than he had expected. His wife Nikole provided continuous moral and practical support. She took days off work to care for their son when Stevenson was 1,100 miles away at the world championships in Louisville. She carried Nils on her chest while watching her husband race at local events, making her way through tall grass and up and down hills. The support and presence of his family factored significantly into another area that contributed to his world champion formation. Stevenson has the physical qualities to go hard and fast on a bike. His toolset includes “an excellent balance” of the two different muscle fibers that support explosive sprinting and endurance. He said he’s measured and knows his VO2 max, lung volume, aerobic capacity, and lactate threshold. But in his opinion mental space contributed more to his successful world championship bid than natural physical gifts. Last season through world championships in February found him in great shape mentally. “…I was so focused on those two events all ‘cross season, really,” Stevenson said. Aside from sticking to plan, for Stevenson focus meant shutting out distractions and whatever could steal away attention from doing and feeling his best. His intense focus results in some rough edges. He’s written about how during race day preparation he won’t let anything or anybody disturb his focus. He’ll “bark” at those around him, even friends who stop by to wish him luck. Posse members however, can also magnify his personal focus. Snow hit Boulder in the weeks before nationals. Training continued. Stevenson and his teammates rode mornings in below freezing temperatures. Instead of fixating on the peanut butter mud, Stevenson set his mind on identifying opportunities to pick up speed, “trying to find a patch of firmness” along the edges of the course. He held his focus right to the end. When he’d built a two minute lead near the end of the race, spectators suggested he sit up and enjoy his imminent victory. But he didn’t slow down. “I was just beady-eyed, determined, focused to get to the line because I knew that even with a minute or more gap, still something can happen,” he said. Stevenson’s world championship journey shows that focus, commitment, a posse, and happy head space reinforce each other. Working together they become more powerful and increase the odds of reaching a goal, even more so when they fit into a person’s circle of life. For Stevenson racing his bike is important. A world championship is important. But both appear to have happened by virtue of the life he leads, not in spite of it. The national and world champion spoke with ProVéloPassion for this story one week after he became the best aged 35 to 39 male cyclo-cross rider in the world. At the time of the interview his blue rainbow-striped world champion jersey from Louisville rested in a pile of unpacked clothing on the floor in his Boulder home. He said he planned to frame it. 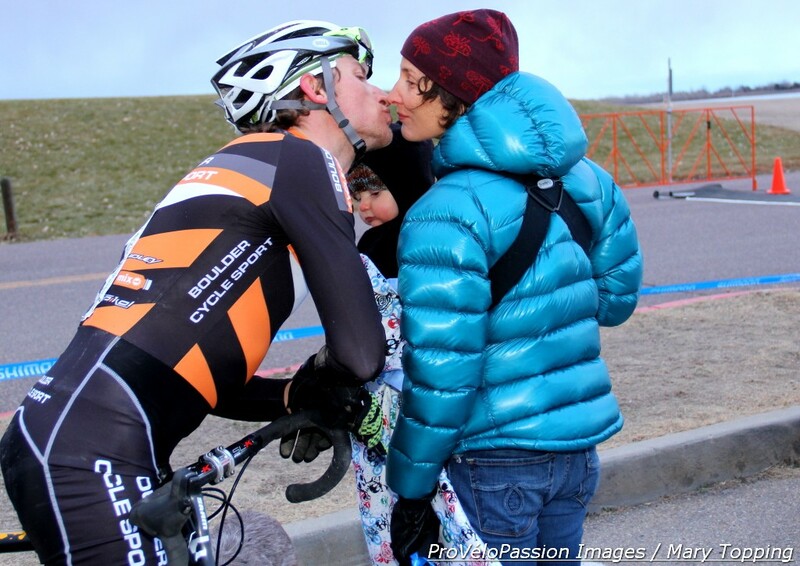 Stevenson joined teammates and friends in the Boulder cyclo-cross community one week later to celebrate the close of the season. At that time the jersey lay folded on a shelf. Several weeks after that party, the world champion jersey had made its way to Stevenson’s closet. It hung in the company of his everyday clothes.